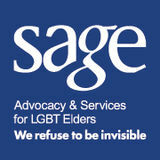 IDENTIFYING AND REFERRING LGBT CAREGIVERS LGBT-identified caregivers make up 9% of the 34 million Americans providing unpaid care to adults over the age of 50.1 Despite being more likely to provide care, LGBT caregivers continue to go ‘under the radar’ of healthcare service providers. This is partially due to a lack of understanding about what caregiving looks like in the LGBT community, who the people in this category typically are, and what services they need. As a health care professional, your ability to identify and refer caregivers to appropriate services can make a marked impact on the overall health of your patients who are providing or receiving caregiving assistance. Caregiving in Context Caregiving is the act of providing physical, psychological, and/or emotional assistance to another person, typically for an extended period of time. The vast majority of older adults wish to age in place,2 and to make this possible millions of Americans provide unpaid care to older adults in their families or social circles. This care may include such things as medication management, meal preparation, transportation, and assistance with Activities of Daily Living (ADLs). Provide visual cues that your practice is LGBT-welcoming (i.e. LGBT-specific resources in waiting area, inclusive non-discrimination policy prominently displayed, rainbow sticker in visible location, etc.). Include sexual orientation and gender identity among demographic questions. Utilize gender-inclusive language, such as partner/spouse in place of husband or wife. Ensure that staff at all levels are trained on LGBT health and the importance of LGBT culturally-sensitive care. IDENTIFY AND BUILD RAPPORT Approach interactions with empathy, open-mindedness, and lack of judgment. Ask your patients if they are providing care for someone. Ask your patients who they rely on for care. Recognize that a caregiver could be anyone in a person’s life, including a friend, neighbor, or ex-partner, and that the caregiver and care recipient may be reluctant to disclose the relationship between them. Notice who is bringing your patient to appointments. That person is likely providing additional care and support, and serving as your patient’s caregiver. 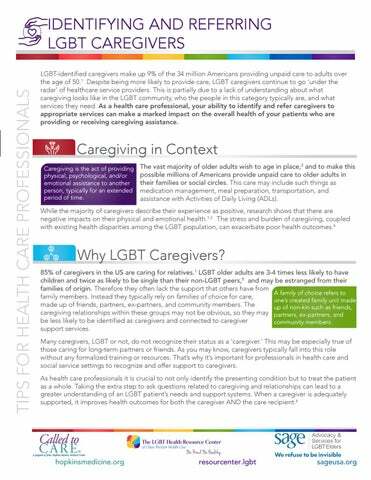 This fact sheet is designed to assist providers with identifying and supporting LGBT Caregivers in a medical setting.